Thanks for signing up to my newsletter list. I won’t send you emails too often, and you can unsubscribe from the list whenever you want. I hope they are of use to you. 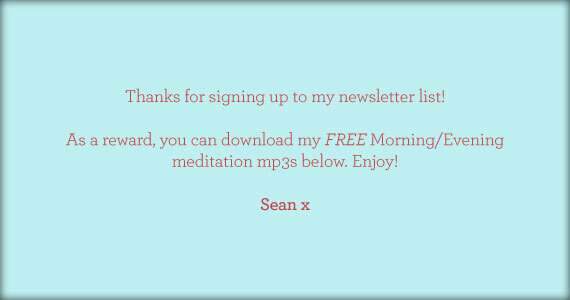 As a reward for joining me you can download my free meditation mp3 files. Just click the corresponding links below and the files should save to your computer, then you’re free to use them as and when you please. Start the day as you mean to go on. Jump out of bed, tell yourself how happy you are and spend 5 or 6 minutes with this meditation. What a day you’ve had. Take some time to relive all of it’s good points. Be grateful for all that you have a go to sleep with a smile on your face. Like this? Why not download my Relax and Let Go mp3 set from my Store? Meditation refers to any of a family of practices in which the practitioner trains his or her mind or self-induces a mode of consciousness in order to realize some benefit. Meditation can be an effective form of stress reduction and has the potential to improve quality of life and decrease health care costs. Meditation involves achieving a state of ‘thoughtless awareness’ in which the excessive stress producing activity of the mind is neutralized without reducing alertness and effectiveness. As you begin to learn more about the art and science of meditation, it’s surprising to learn that certain meditation techniques have a tremendous effect on your ability to calm yourself and relax. We all have trouble with relaxation in this busy world of ours. The “discipline” of meditation helps us learn to put those cares and worries on the shelf for a little while. In doing that we can slow down and let our insides catch up with our outsides. When you meditate, you slow your heart rate, your breathing calms, your mind settles down and your thinking becomes more rational. Few people realize that worry and stress have big effects on our bodies including our blood pressure, our heart rate and our breathing. Meditation, by helping us put those things back into balance, brings a natural state of relaxation that makes all of life easier to take. One Comment on "Thanks for signing up!"